Indian citizens can make their tax-deductible donation to the Aam Aadmi Party from their Indian and Foreign accounts. Online donation via Net Banking, Credit Card, Debit Card, Wallets (e.g. MobiKwik, Airtel Money, PayTm, etc. ), UPI (Unified Payment Interface), Cash card, or Direct Fund Transfer using NEFT/RTGS, or Systematic Donation via NACH, or Sending Cheque or Demand Draft. International Credit Card, International Debit Card, Online Remittance, or Sending International Cheque or Draft. For your preferred donation option, follow the corresponding instruction below. Click here to donate online via national or international Credit Card / Debit Card, Net Banking (Indian banks only) or Wallets (e.g. MobiKwik, Airtel Money, PayTm, etc. ), UPI, and Cash card. Simply follow this link and keep your credit card/debit card/Net Banking details ready. After one-time setup, you can make recurring or one-time funds transfer via NEFT/RTGS as often as you wish without any hassle of filling forms. Click here to register for funds transfer directly from your Indian bank account anytime. Once you register, you will get simple personalized instructions for transferring directly from your bank. This simple procedure is explained in this document. Our NRI supporters with valid Indian passports can easily remit donations to Aam Aadmi Party through an online fund transfer from their foreign bank accounts to our bank account. Click here to make an online remittance through our donation portal. We encourage you to donate monthly via NACH (National Automated Clearing House) service, a platform setup by NCPI (National Payments Corporation of India). Download NACH form (Front side) in PDF, print, fill and submit it at an AAP office. 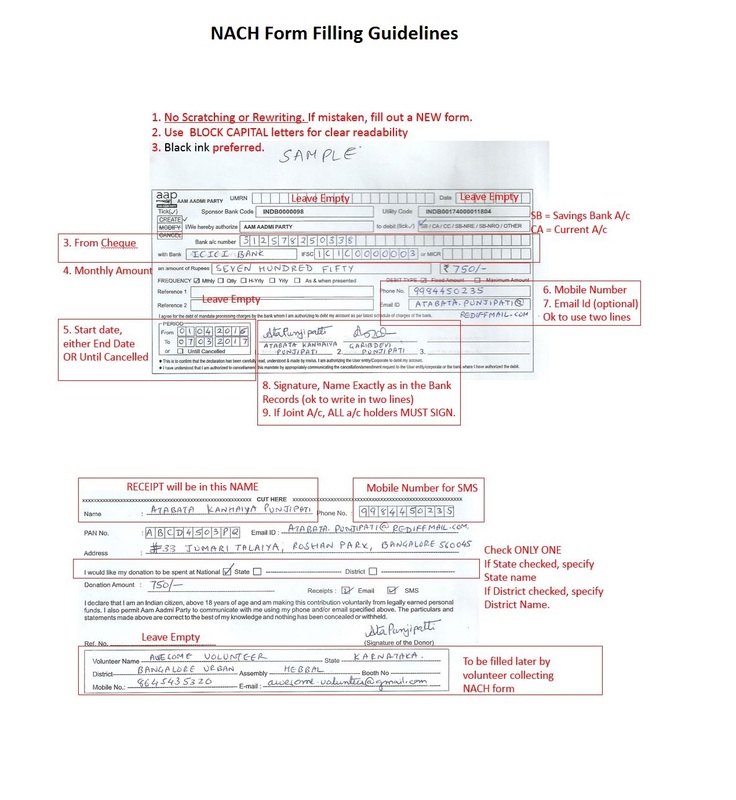 To avoid errors, please review a Visual Guide for Filling NACH form in JPG. You may also view the Instruction side of NACH form in PDF, and a Video Tutorial. Income of and/or contribution to a political party registered under Section 29-A of Representation of People Act 1951 are exempt under Section 13-A and 80GGB/ 80GGC respectively. For this purpose, no registration/certification is required under IT Act 1961. Therefore, registration certificate issued by Election Commission of India and PAN allotted by Income Tax Department are the only two documents which enable a registered political party to collect contributions. You can find our registration number and PAN number below.